Why is my form not displaying on my mobile? 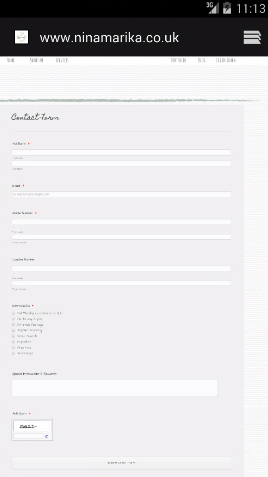 Created a form on a new website im creating called ninamarika.co.uk and the form does not display on my mobile. Is there an option I need to check to allow the form to display on all devices? I checked your form on both Android and iOS devices and I was not able to replicate the issue. I checked your forms setting in the Form Designer and I can see that you have enabled the option that says "Make your form response." Base on my checks, it appears to be responsive when viewed on a mobile device. Can you state which mobile device you are using or if this display issue still exist? You should also consider clearing your browser cache on your mobile to see if that will help. I still cannot get this form to work on my site with iphones 5 and 6. Have you looked at the actually domain ninamarika.co.uk? 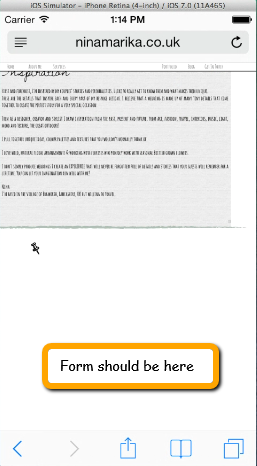 Im using Adobe Muse could this be the issue? And I have cleared my cache. That is correct, I tried the domain you provided. I did a test on iPhone 5, iPhone 5S as well as iPhone 6 and I was able to replicate this issue on all. Where the form is suppose to be appears to be blank. Adobe Muse should not be the problem seeing that it is displaying fine on Android devices. Can you embedding your form using the iFrame Method to see if it would work? Please do and let us know the outcome. Its good to know that your issue is now resolved. Feel free to contact us if you need our assistance once more.